Sera Monastery is one of the 'great three' Gelukpa university monasteries of Tibet, located 1.25 miles (2.01 km) north of Lhasa. The other two are Ganden Monastery and Drepung Monastery. The origin of the name 'Sera' is attributed to a fact that the site where the monastery was built was surrounded by wild roses (se ra in Tibetan language) in bloom. The original Sera monastery is located in Lhasa, Tibet, about 5 kilometres (3.1 mi) north of the Jokang and is responsible for some 19 hermitages, including four nunneries, which are all located in the foot hills north of Lhasa. 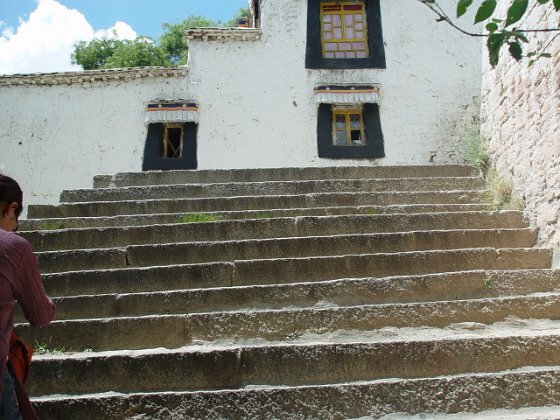 The Sera Monastery, as a complex of structures with the Great Assembly Hall and three colleges, was founded in 1419 by Jamchen Chojey of Sakya Yeshe of Zel Gungtang (1355–1435), a disciple of Tsongkhapa.